Sat, Mar 23, 2019, 09:24 pm SL Time, ColomboPage News Desk, Sri Lanka. Mar 23, Colombo: Oman's Minister of Oil and Gas is Mohammed bin Hamad Al Rumhi arrived in Sri Lanka on Saturday to attend the ground breaking ceremony of Oil refinery in Hambantota scheduled for tomorrow. 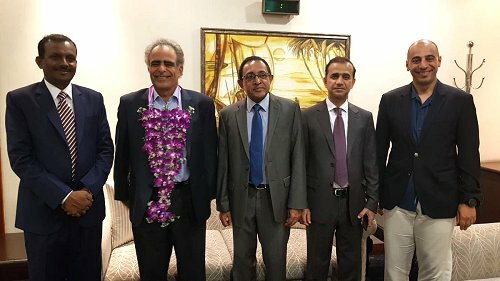 The UNP in a Twitter post said Oman's Oil and Gas Minister Dr. Mohammed Hamad Al Ruhmy was received by Minister Kabir Hashim at the Bandaranaike International Airport this afternoon. "Hon. Al-Ruhmy will be attending the ground-breaking ceremony of the Hambantota oil refinery tomorrow," it said. Chief Executive Officer of the Oman Oil Refineries and Petroleum Industries Company (ORPIC) Musab bin Abdullah al Mahrouqi has accompanied the Omani Oil and Gas Minister Dr. Ruhmy, who is also the chairman of the fully-state owned company. During their stay, the Omani delegation is scheduled to hold talks with Prime Minister Ranil Wickremesinghe and other ministers. The ground breaking ceremony will be held at the Mirijjawila Export Zone in Hambanthota tomorrow under the patronage of Prime Minister Ranil Wickremesinghe. The Premier will lay the foundation stone for two major investment projects in the history of Sri Lanka in the Mirijjawila Export Processing Zone tomorrow. Earlier the Oman's Oil and Gas Ministry denied being part of a $3.85 billion plan to build an oil refinery in Hambantota after Sri Lanka's Board of Investment (BOI) announced that Oman oil ministry and Silver Park International PTE Ltd - a Singapore investment vehicle owned by India's Accord Group had agreed to build the 200,000 barrel per day refinery near Hambantota port with the historic investment. The BOI later clarified that there is no agreement signed between Oman's Ministry of Oil and Gas and Silver Park International with regard to equity arrangements of the project but the state-owned ORPIC has registered their firm intention to participate in equity up to 30% subject to reaching agreement between the parties.